My dentist is at the St Mary's stop on the MBTA's C Green line. I make my appointments with her for late morning or early afternoon so that the Japonaise Bakery will have its daily supply of multi-grain bread ready. The bread has a hearty crust with a soft heart. It is filled with flavor and seems to disappear within hours once Ed comes home. 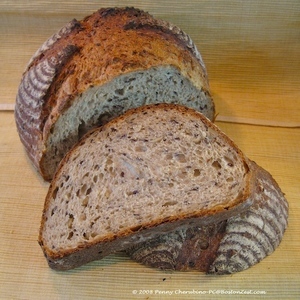 It is made of wheat, white, oat and rye flour to which they add sunflower, fax, and sesame seeds. Today, I couldn't resist taking a break to celebrate a great cleaning and check-up by having lunch at the Japonaise. They prepare a good selection of sandwiches and special "rolls" that are quick to order and a real treat. Today I opted for a "Curry Roll." 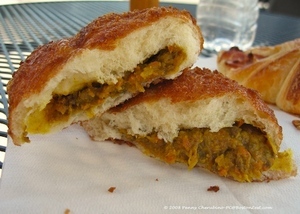 Imagine a light, fine textured bread roll filled with a lightly spiced and tasty curry. I had mine cold, but they will be happy to heat it for you. The area around this T-Stop is filled with interesting and useful businesses. I'll be covering more of them in days to come and I'll be reporting on other T-Stops as the months go by. If you have a favorite stop, surrounded by great places, let me know.